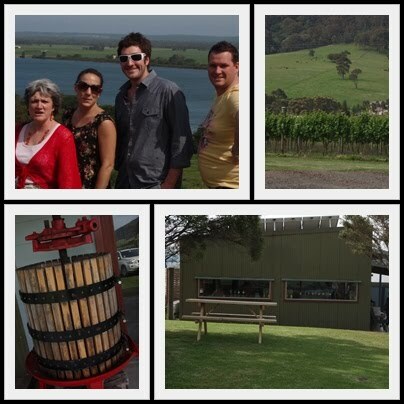 My nephew Mark and his best buddy Beth were down this weekend from Sydney and after a family bbq on Friday night (photos to come) we decided to do a local winery trip today. So Beth, MArk, Davina, Royce & I headed of just after 11am. We started with a High tea for lunch at Belachara, Gerringong, That was wonderful and we had the best prawn sandwich that we have ever eaten. The scones were quite amazing also. 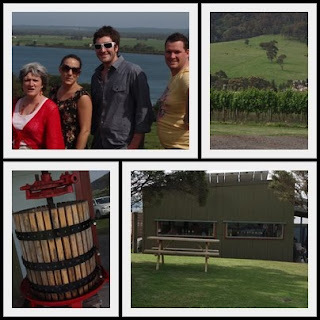 We then headed to the Crooked River winery at Gerringong but were quite disappointed with the way we were treated there. But we still came away with some amazing white Pyjama port and a gorgeous pyjama chocolate port, so called cause the best way to enjoy them is to be curled up relaxed in your pj's. Next stop Mountain Ridge at Coolangatta. We arrived at the tail end of a bus tour so we walked in to the most amazing atmosphere. Despite being ridiculously busy we were made to feel very welcome and quite special. The bus group left and the other small groups left and we were all alone in the cellar door. The treatment we were given there was incredible. 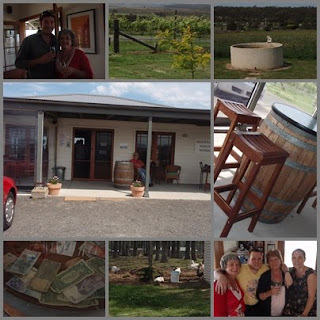 Nothing was to much for them and they were very happy for us to try as much as we wanted (the place b4 had a limit of 5 tastings and we were reminded several times of this). We came away with quite a lot from here including an amazing Macadamia liquor and a Bramble port (blackberry seeped port) yummmmmmm oh and some beer made on the premises. we were also served, just b4 we left, a platter of home baked crusty bread with dukka and olive oil balsamic vinegar, yum. Because we were the only people there at this time we were told the history of the winery and their vision for the future. 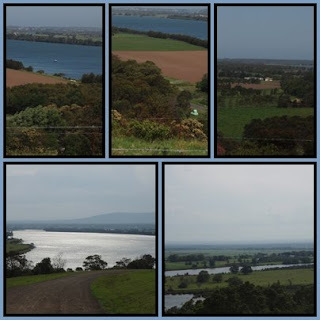 views of the Shoalhaven river we had. When we arrived here there was already a tour bus there and another one arrived not long after we did so they were extremely busy. They had some lovely wine including a sweet desert wine called sticky fig and a great tawny port. I kept running into a really nice guy who just wanted to have his photo taken, so if you my friend have made it here to my blog I hope you have enjoyed my memory of the day in photos. Today has reinspired my son to one day own a winery with a self sufficient restuarant on the same property. Isn't it nice to dream. I have had a few people ask how I do my photo collages. My sister in law Cathy told me About a free download programme called photoscapes. So I googled it and found their website. Downloaded the program and off I went. I have only just scratched the surface of what this editing programme can do but am very happy with what I am doing so far. When I have more time to play I will try out the other things it can do aside from collages. When/if you do download this programme the one thing I first struggled with was what part of the programe does the collages - so I will tell you its the "Pages" icon that is at approximately 2 o clock on the home page icons. Beautiful pictures, Gail. 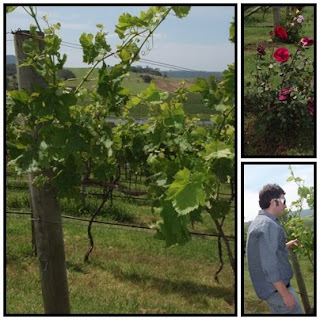 Yes it is amazing how different some wineries can be. We used to go to Draytons in the Hunter Valley. DH would get some port, and other bevs. for Xmas. He had a list and just told them what he wanted. We weren't intending to have a tasting but they insisted ( they did know us from some family association many years before through DH's "Da". Trevor said " I insist on you trying some of the wines. We have heaps of people that drive here from Sydney, try everything in the place and don't buy a single bottle!" Maybe that has happened a lot to the first winery you visited but they aren't going to help their cause "reminding" everyone about the limit of 5 tastings, that's for sure. The macadamia liquer sounds absolutely delicious. And the pics of the views are great. Sounds like a fab way to spend a day. ooo that's a great post Gail! I've always wanted to take a wine tour and you've just inspired me all over again.Hope we have as much fun as you did when we finally go on one :) Barb. Lovely post with enticing pictures of views and fun. I guess I should start a wine tour with the local wineries ;O.